The Covered Wagon Ranch is a mountain guest ranch which has been accepting a limited number of guests since 1925. Serving third and fourth generation guests who visit year after year is not unusual! We are proud to cater to all levels of riding ability. Rides are filled with dramatic, pristine views of the country surrounding us. Our summer horse riding season runs from the beginning of June through the end of September. Located at the confluence of the Taylor Fork and Gallatin Rivers, fly fishing at Covered Wagon Ranch is world class! It resides in prime fly fishing territory. Other area rivers such as the Madison, Yellowstone, Firehole, and Missouri are only a day trip away. Guides services are available upon request. Charming vintage cabin accommodations, hardy western meals served family style, and a week of horseback riding are included in our weekly rate plan. Also available are daily rates including accommodations and meals for those interested in enjoying Yellowstone Park and surrounding areas. A three-night minimum stay is required. 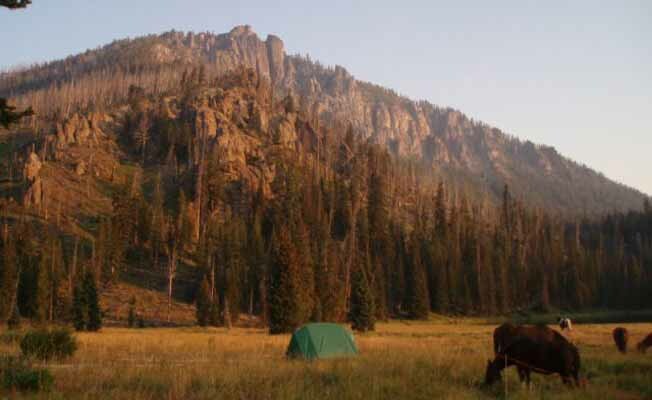 Experience a true Montana getaway the way it used to be! Visit us at Covered Wagon Ranch!